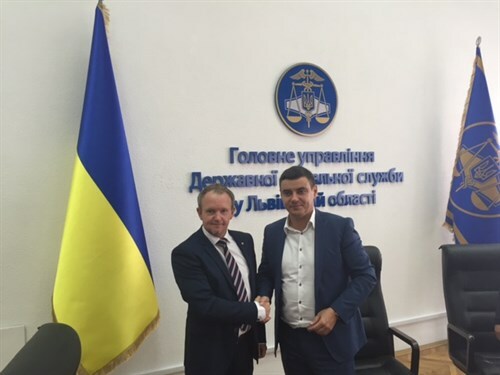 DBA President Mr. Lars Vestbjerg and DBA Head of Communication and Lobbying Mr. Oleg Yanytskyy met with the new appointed Chief of State Fiscal Service in Lviv Oblast Mr. Igor Kondro to promote and discuss the lately signed Memorandum between DBA, SFS, LOSA and Custom Office in Lviv Oblast. The agreement is to support each working projects to support investors and create conditions of transparency from Danish companies towards Ukraine. DBA highlighted the unfair competition on the employment market where foreign investors are full white companies supporting the Ukrainian State Budget with full range of taxes and the grey economy where only partly taxes are paid. STA expressed that Ukraine appreciate to support of Danish Investments in Ukraine with the aim comtinue fully supporting Danish Investments. With many years cooperation and working direct with Lviv STA, DBA greeted the Chief and his team for working with the Investors in the frame of solving problems fast.